Every year men and women spend millions of pounds on chemical-laden artificial products to ensure that their hair looks attractive and natural. However, you can save money, save the environment, and save you hair while achieving the same results by using products found in nature. No matter what type of hair you have - oily, dry, damaged, colour treated, or healthy - there is a recipe that can be made from products you most likely already have in your kitchen that will bring out the best in your hair and keep your hair looking gorgeous day after day. First, you need to start with a basic natural shampoo recipe and then you can add ingredients like essential oils to personalize the shampoo to your hair type. For this first recipe you will need one egg, 1 teaspoon each of lemon juice and olive oil, ½ cup plain tap water (or for added cleansing you can substitute this ingredient with ½ cup of herbal tea) and one tablespoon of castile soap (which can be found at any health food or specialty store). Blend the ingredients with a hand mixer or in a blender and pour the shampoo into a clean plastic bottle. For the second recipe you will need 4 tablespoons of pure soap flakes and one and one half tablespoons of glycerin, both which can be purchased at any health food or natural herb store. First, bring one and one half cups to a boil. Remove the water from the heat and add in the soap flakes, stirring until the flakes are dissolved. Next, add the glycerin and stir again until the glycerin is dissolved. Transfer the mixture to a clear plastic bottle and keep in a cool, dark place for up to a week. Both of these recipes offer great cleaning power to remove dirt, grime, pollution, and product build-up from the hair. In order to increase the effectiveness of the shampoo and personalize it to your hair type you can add one or more of the following ingredients. For added cleaning power and to remove any unwanted orders try adding a small amount of baking soda to your shampoo recipe. This addition is great after exercise workouts or long nights in smoky bars. For oily hair, or to help eliminate dandruff, try adding five drops of lavender essential oil to the mix. 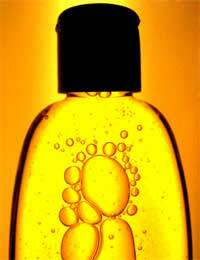 The oil will help reduce the production of the oil glands found on the scalp sooth itchy, flaking skin. For added shine add five drops of chamomile essential oil, which also helps promote healthy, manageable hair strands. If your hair is very dry or damaged try adding five drops of rosemary essential oil or one teaspoon of avocado or jojoba oil, or both. The conditioning properties of these ingredients will help soften hair and seal the hair follicle to prevent further damage. Plus, the oils will hydrate the hair and help the hair strand hold moisture all the way to the root. Finally, you can add two teaspoons of catnip, five drops of sage or burdock root, or one half ounce of nettles to your basic shampoo mixture to stimulate the hair follicles, promote hair growth, and strengthen hair strands to reduce hair loss.